Stratolaunch completed the first flight of its twin-hulled airplane Saturday morning. the largest airplane ever created—and its record-breaking 385-foot wingspan—took off for the very first time. The aircraft, from the company Stratolaunch, has been eight years in the making. By 2022, the company hopes to use the twin-fuselage, six-engined, catamaran-style aircraft to launch satellite-bearing rockets into space. “All of you have been very patient and very tolerant over the years waiting for us to get this big bird off the ground, and we finally did it,” Stratolaunch CEO Jean Floyd told reporters on a press call. The company reported the airplane hit speeds of 189 mph and heights of 17,000-feet during its 150-minute test flight, before landing safely at the Mojave Air and Space Port. “The systems on the airplane ran like a watch,” test pilot Evan Thomas told reporters. But the day’s events were bittersweet. Microsoft cofounder Paul Allen, a longtime space enthusiast who founded and funded the Stratolaunch project, passed away last October at age 65, from complications related to non-Hodgkin’s lymphoma. “Even though he wasn’t there today, as the plane lifted gracefully from the runway I did whisper a ‘thank you’ to Paul for allowing me to be a part of this remarkable achievement,” Floyd said. One day soon, Stratolaunch hopes to carry 250-ton rocket ships loaded with satellites to a height of 35,000 feet—into the stratosphere. Once at cruising altitude, a rocket’s engines would ignite, carrying it and its satellite cargo the rest of the way into space. Only a select few facilities, like the Kennedy Space Center in Florida, can handle rocket launches, which means tight competition for scheduling and long wait times. Airplanes can take off from many more runways, which Stratolaunch hopes will give its aircraft a competitive edge for those wishing to launch satellites into orbit. Stratolaunch’s ambitions have shifted in past years. It originally intended to carry modified SpaceX Falcon 9 rockets into space, but the two companies soon parted ways. By 2016, it had found a new partner, Northrop Grumman-owned Orbital ATK, which builds the Pegasus XL rocket. Stratolaunch once hoped to build its own rocket ship and rocket engines, but it discontinued that project and laid off some workers earlier this year. 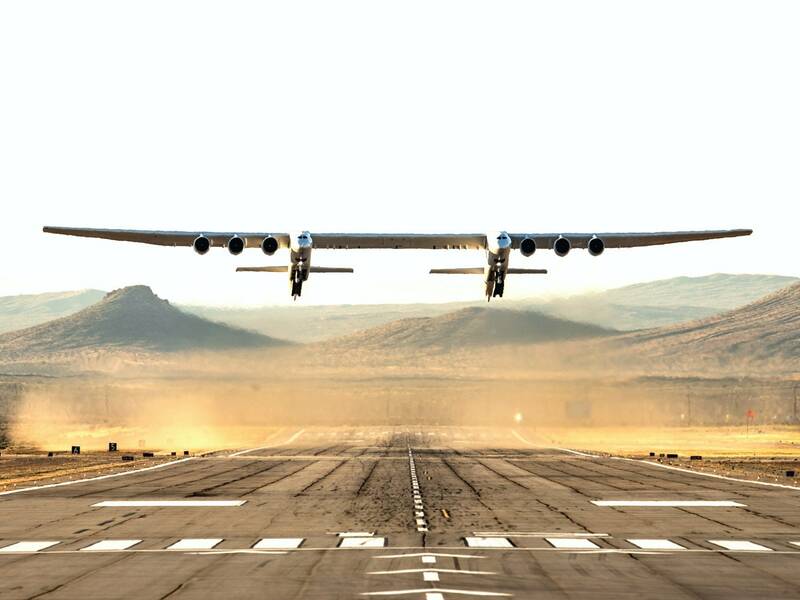 Though representatives for Allen’s holding company have said that the billionaire set aside funding for Stratolaunch before his death, the venture’s future is not entirely clear. A company spokesperson could not immediately say when Stratolaunch planned to complete additional flights, and the aircraft will need certification from the Federal Aviation Administration before it can begin to carry rockets and satellites into space. The Stratolaunch project faces outside pressure, too. Richard Branson’s Virgin Orbit company seeks to run its own test of a modified Boeing 747 later this year—an airplane also built to carry satellite-bearing rockets into orbit. And at the back of all these ambitious engineers’ and aviation experts’ minds, too, is the specter of theSpruce Goose. The airplane, a marvel when completed in 1947 as a pet project of the eccentric business magnate Howard Hughes, flew just a single one-mile flight before retiring to an Oregon museum—where Allen reportedly visited it.